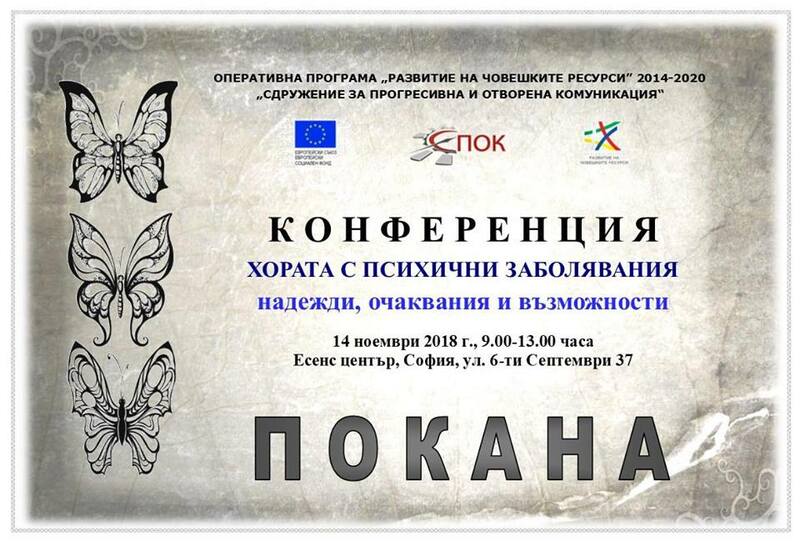 Invitation for conference “People with mental illness” | Association “Sustainability of Progressive and Open Communication"
With reports from experts and experts from Austria, England, Bulgaria, Germany and Hungary. – Are family relatives prepared for mental illness? 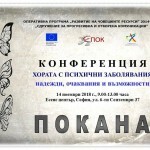 – What are the Occupations in Bulgaria with Risks to Mental Health (results sociological survey)? – Prevention of Suicidal Behavior and Depression (European Alliance Against Depression). Problems, difficulties and possible solutions. Study of people with mental disabilities and their relatives. Employment for people with disabilities. Risks Related to Parental Psychological Disorders – Facts. Factors influencing the family response and its consequences. 11:10 – 11:30 h. WHAT ARE THE PROFESSIONS WITH RISKS ABOUT MENTAL HEALTH? About the relationship between human security and depression (results of a sociological survey).